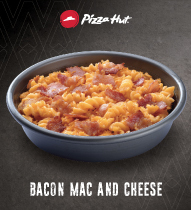 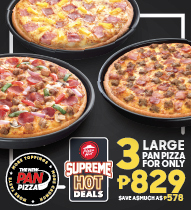 Available with a purchase of any Large Pan Pizza ala carte in the following flavors: Hawaiian Supreme, Bacon Margherita, Supreme, Chicken Supreme, Italian Delight, Bacon Cheeseburger Supreme, Super Supreme, and Meat Lovers. 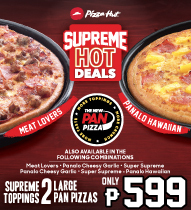 Composed of: Large Hawaiian Supreme Pan Pizza, Large Bacon Cheeseburger Pan Pizza, and Large Supreme Pan Pizza. 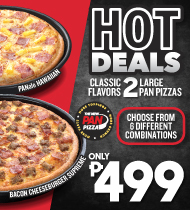 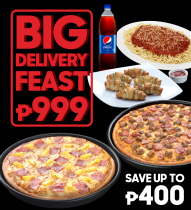 Enjoy one Large Specialty Pan Pizza and a Panalo Pizza all for just P599. 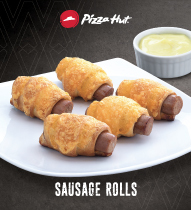 Our own sausage recipe baked in soft dough and topped with melted cheese. 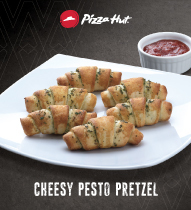 Cheddar cheese and pesto rolled in soft dough and baked to perfection. 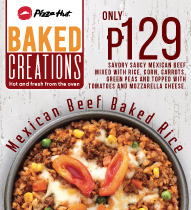 6 pieces per serving, served with sweet marinara sauce. 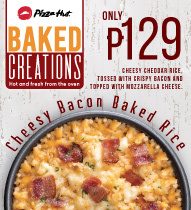 A childhood favorite made with crispy bacon and real cheddar baked fresh from the oven.